Situated in an elevated position, the Paul Marie Hotel Apartments features a roof top swimming pool overlooking Ayia Napa. Within a three minutes walk you will find yourself in the resort's centre and the nearest sandy beach is a further ten minute walk. It was absolutely amazing. Before going i heard bad reports but when we arrived the room was clean. When i saw the pool i got scared but i think that it is good that the pool is small cause it brought the members of the hotel closer together and everybody knew everybody. It is also a 5 minute walk from everything like the nightclubs and the strip. The workers are amazing, Chelsea, Donna, George and Katie. I am back a week and i am already looking to book for next year. It was the best holiday ever! hotel was fantastic perfect for a young group. 9 lads from bolton came and had best times of our lives. staff are excellent george, boris, katie. rooms basic but very clean only saw couple of roaches in two weeks. good location 2 mins from main strip but further enough away get some peace and quiet. food is great cheap as well. loved the place would definitely go back paul marie is a unique funny memorable place to stay. Hotel was fantastic perfect for a young group. 9 lads from Bolton came and had best times of our lives. Staff are excellent George, Boris, and Katie. Room’s basic but very clean only saw couple of roaches in two weeks. Good location 2 minutes from main strip but further enough away get some peace and quiet. Food is great cheap as well. Loved the place would definitely go back Paul Marie is a unique funny memorable place to stay. We arrived early on the Sunday morning. We were given two apartments with more than enough space for the 6 of us. Both apartments were spotless on arrival and the location was fab for less than a 3minute walk to the start of the strip. The hotel was lively and very noisey regardless of the time of day so it is definitely not suitable for older couples, families or people looking for a quiet holiday. The hotel is brilliant for people looking to party all holiday and the noise is bearable to sleep through. The cleaner came in every morning to tidy, make the beds and even cleaned up our dishes from the night before! The pool bar blasted out great music every day from opening til close and even though the pool is fairly small, the roof top location makes it a sun trap for those who love 2 sunbathe! The hotel bar had a great atmosphere every night where happy hour for 2euros a cocktail always went down well. I would defo visit here again in a second! The hotel is situated in a really bad location, the pool is more like a paddling pool. The rooms have air conditioning you have to pay for but it only blows in one room which makes that room freezing and the rest of the apartment red hot. The beds; I ended up sleeping on a camper bed, my friend on a sofa. 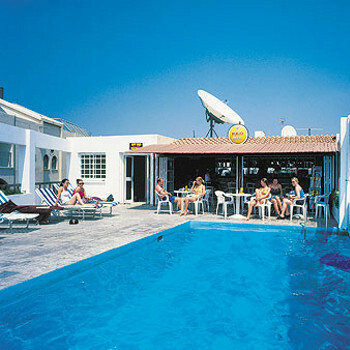 we stayed here in june.. its a great place to stay if you dont want sleep and just want to party your hole holiday. the staff are ok . the barmans a bit strange..the rep sonny was a legend.we pushed im in the pool most days. he got us tickets for the bar crawl, wot a wicked night.DO IT..
ayia napa is legendary..wot a great place. if you want a cheap holiday go paul marie. if u got sum money stay somewhere else. but it is lively and a rite laugh. Well... what a holiday we had at this place! The staff were great and we had such a laugh with them! Boris (nickname) the barman was legendary and had a great sense of humour. The general atmosphere was fab and everyone was really really friendly. From some of the previous reviews we were expecting a complete hole but we were really pleasantly surprised. Yes it is basic but you do know this when you book. The rooms were clean and new towels were provided daily. The aircon was fine, infact sometimes it was so strong we were freezing! It has a large bar area with internet facilities (for you fellow MySpace and Facebook addicts! ), happy hour, pool tables, sky tele etc. Plus the food is champion. The location is fantastic, literally a few moments away from the strip where all the clubs and bars are and only a swift stroll to the beach. There is a shop literally round the corner which sells everything you need. As you can tell, we really liked it here and have already booked upto go this year! there was only 1 air conditioning unit which worked in one room only, therfore 4 of us had to share one room which had only 2 beds in ! !